A classic tale of unlikely friendship featuring two lovable new characters. Every Monday, Professor Bumble and his fishy friend Beluga go swimming at the lake. One day, Otter warns them of a mysterious creature lurking in the depths a beast that could swallow a bear in one bite!” The ever-cautious Professor Bumble resigns himself to the safety of the shore, while bold Beluga decides to brave the water. 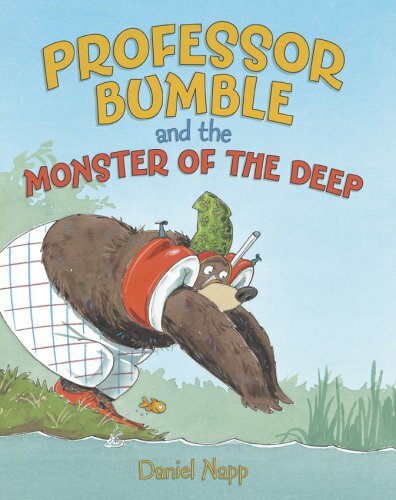 But when Beluga’s bowl suddenly tips and he disappears into the lake, it is up to Professor Bumble to save his buddy and face the Monster of the Deep. This charming picture book features a comic friendship that will remind readers of such odd couples as Winnie-the-Pooh and Piglet or Frog and Toad, and leave them wishing for more adventures with Bumble and Beluga. Daniel Napp studied graphic design in Germany, where he resides today. He has illustrated numerous popular books for children that have been well received worldwide. Visit www.daniel-napp.de.